In the HVAC industry, the right tools and processes empower field technicians to do their job effectively. Day-to-day operations run smoothly if everyone remains properly informed about job cancellations, location changes, or rescheduled call times. Frustration can build if time gets wasted frequently due to inadequate communication. Mobile HVAC software makes it easier than ever to deliver pertinent information to your team in real time, ensuring that issues get addressed as they arise. Receive updates quickly and transmit information accurately with mobile HVAC software. Client cancellations and rescheduling represent big parts of the HVAC industry. Unless your company’s scheduling process is bulletproof, this leaves room for the kind of error that can carry big consequences for efficiency. These consequences can take the form of field techs showing up to jobs that got cancelled at the last minute, two techs showing up to the same job, or even inadvertently double booking your workers. Trust can erode quickly. Rebuilding a tarnished reputation of reliability can make for an enormous challenge, one well worth taking steps to avoid. Mobile HVAC software ensures that your team receives up to the minute notifications regardless of their location. The iFleet field service app works hand-in-hand with HVAC software for Quickbooks, combining mobile versatility with the flexibility to integrate your business’ existing system. With little more than the click of a button, you can update your team’s work schedule. 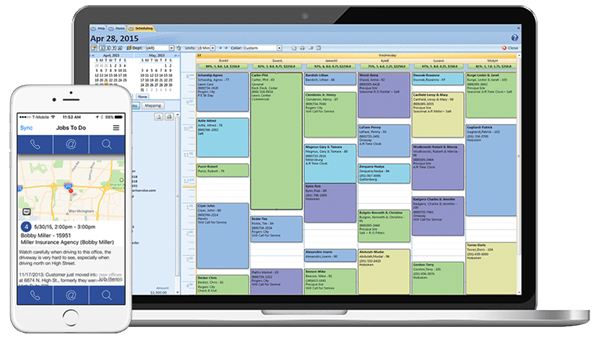 Whether you need to schedule recurring work, emergency work, or multi-day work, there’s nothing this mobile HVAC software can’t handle. Consider the amount of time your team spends simply driving to and from the office to collect, complete, and submit paperwork. Mobile HVAC software allows your field technicians to complete and submit paperwork remotely, cutting down on the wasted time they could better spend completing service calls. Instead of driving to pick up a schedule, download it directly to the app. Instead of submitting a stack of completed work orders at the end of the day, submit them as jobs get completed. Wondering how an intuitive and mobile friendly field service app can improve your business? Request an iFleet demo to give it a try! Every business is different, but pretty much every HVAC service provider can still stand to improve their prospects with mobile HVAC software. Update schedules, add pictures to work orders, easily take notes on the job, and even reference past service history with mobile HVAC Software. Some traditional HVAC software packages lack the ability to easily scale as your business grows. Software that works great for managing a small client base becomes convoluted and clunky when your clientele doubles or triples a year or two down the line. iFleet user-defined fields let you track any data you can think of, integrating with your existing QuickBooks database without adding hassle or extra costs. This feature provides the necessary tools and functionality to reliably serve your HVAC business for years to come. Mobile HVAC software can offer time-tracking abilities for billing purposes, equipment tracking to help with coordination and asset monitoring, free you from the hassle of keeping tabs on workers, and so much more. If you think your business can benefit from mobile HVAC software, see for yourself by scheduling a free demo today!